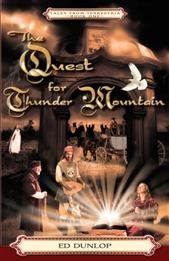 Homeschool Blogger is giving away 15 copies of The Quest for Thunder Mountain, the first book in his new Tales from Terrestria series by Ed Dunlop. The Quest tells the story of a young minstrel whose life is shattered when his career comes to an abrupt end. The book was written to help young adult readers experience the wonder of finding and doing the will of the King. You can see the TOS review of the Terrestria Chronicles at: http://www.talesofcastles.com/ . The contest ends on November 9th, so head on over to Homeschool Blogger and enter your name in for a copy of the book!